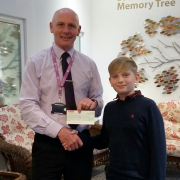 PR: The guys or the girls – who will raise the most for St Luke’s? As two of the city’s most popular fundraising events are launched this month, St Luke’s Hospice Plymouth is laying down a challenge to men and women in the community – who can raise the most funds for the vital end of life care the charity provides? 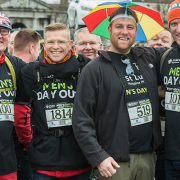 Men’s Day Out and the ladies’ Neon Midnight Walk are two of St Luke’s flagship events, raising money to help ensure it can continue to give free and outstanding care to people living with a life limiting progressive illness, as well as supporting their families. Both events are an opportunity for people to gather their friends, walk in memory of loved ones and create new memories while enjoying the fun atmosphere. This year’s Men’s Day Out, on Saturday 24 March, is set to be manlier than ever. Powered by IU Energy, the day of rugby and banter will see 2,000 men – many in fancy dress – walking a 12km route through Plymouth city centre and along the South West Coast Path before enjoying a well-earned pasty and pint at Plymouth Albion RFC, where they’ll see Albion take on Coventry in a top of the table clash. Registration for the event is £32, which provides a t-shirt, pasty, pint and rugby match ticket as well as covering the logistics of the day. Also putting their best foot forward for St Luke’s will be thousands of women ‘getting their glow on’ to take part in this summer’s Neon Midnight Walk, on Saturday 21 July. 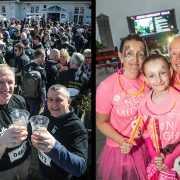 The event, sponsored by Nash & Co Solicitors, will see the ladies striding along a 3, 6 or 13.1 mile route from the Piazza, Royal Parade, through Plymouth, remembering loved ones and enjoying the electric atmosphere with their friends. There will be a warm-up with party tunes at the Piazza before the first walkers set off at 9pm. This year’s warm up will be lead by Cheezifit, the new craze that’s sweeping Plymouth, the innovative way to exercise whilst listening to your favourite cheesey tunes. 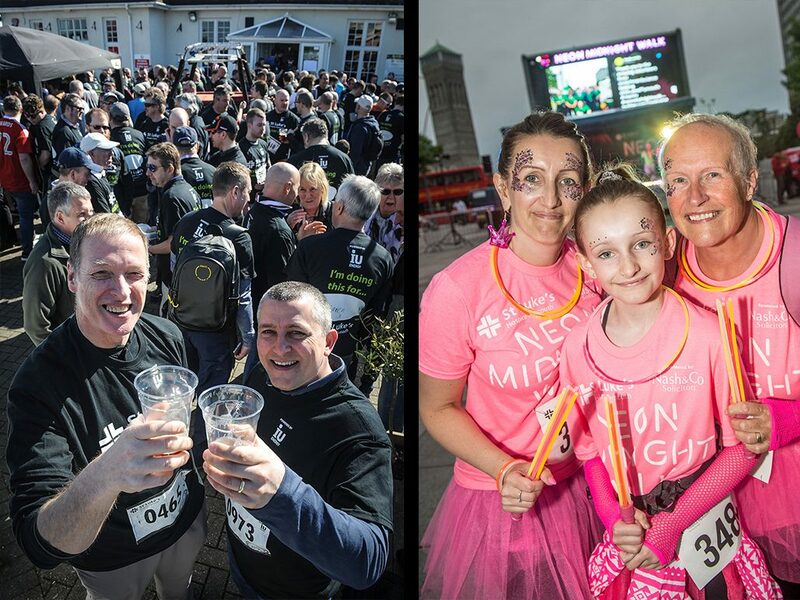 Registration for the Neon Midnight Walk costs £22 and includes an exclusive neon t-shirt, as well as a medal and goody bag for all finishers. Register for either of these events online, or call 01752 492626 for further details. 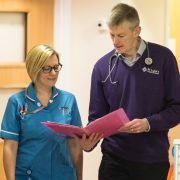 https://www.stlukes-hospice.org.uk/wp-content/uploads/2018/01/BLOGv2.jpg 773 1030 Robert Maltby https://www.stlukes-hospice.org.uk/wp-content/uploads/2018/04/stlukes-logo.png Robert Maltby2018-01-18 12:22:312018-04-18 12:36:16PR: The guys or the girls – who will raise the most for St Luke’s? BLOG: The end of the story? 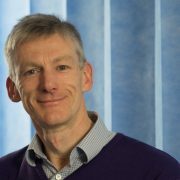 In the final of a series of articles on our care, Dr Jeffrey Stephenson, consultant in palliative medicine and medical director, explores what makes a good death. So what makes a good death? In hospice care we certainly have an idea in mind of what a good death looks like: peaceful; in bed; pain and other symptoms controlled; loved ones by the bedside, or at least with that option; relationships restored; affairs in order; closure on the important issues that have arisen. That may not be everyone’s ideal. Some may wish to go out fighting, never accepting the affront of death, ‘raging against the dying of the light’ (Dylan Thomas). For most people a good death involves being comfortable with symptoms controlled, being with loved ones, and retaining some sense of control and independence for as long as possible. Place of death is often less of a priority than one might expect, given the recent emphasis on achieving preferred place of death. Although many patients express a wish to die at home, this may change as they get nearer the end and the priority becomes feeling safe and not a burden to loved ones. The top priority for most, being comfortable and pain free, is entirely achievable for almost all, provided there is access to the appropriate medication and staff who understand how to use it safely and effectively. And as a last resort we can sedate the patient for those last hours or days until death. Sadly, we have still not consistently achieved this for all patients dying in any setting, and therein lies the ongoing challenge of service planning and education. For some people a good death would involve control over the timing and manner of their dying through assisted suicide. Sometimes this is driven by a fear of a difficult death, or a desire to avoid gradual deterioration and increasing dependence with implications on perceptions of dignity. One might suggest that if hospices are genuinely concerned with promoting choice and dignity in dying then assisted suicide should be something they would support. There are certainly strong and valid arguments on both sides of the debate. At the moment assisted suicide remains illegal, and hospices are not in the business of deliberately hastening people’s deaths by any means. Personally, I am against a change in the law to allow it in any form. While sympathetic and concerned for the distress of individual patients who want it, as a doctor I also have a duty to the wider community, and I am more concerned about the implications for the much larger majority of vulnerable patients who would never otherwise consider it. I believe that, whatever safeguards were put in place, there would be an inevitable slide down a slippery slope, and I am not reassured by the flawed experience of other places that allow it. I do not see how one can prevent a right to die becoming a duty to die in the minds of vulnerable, often elderly patients. We do not need assisted suicide to give people a comfortable and dignified death. There is of course much that we can’t control as we deteriorate gradually from a chronic illness. But for those of us who have the privilege of being able to prepare for our deaths there are some things we can control. We can set out what we do and don’t want to happen to us as we get more poorly, through wills and advance care planning. We can talk to loved ones and professionals about what is important to us, and appropriate support and medication can be put in place. And we can get our affairs in order, say the things we want to say, reconcile with those who have drifted away for whatever reason. We can finish well. Our story can end well. And in fact our story needn’t end with our death if our legacy lives on in the lives of those we have touched, whether family, or friends, or strangers who for a brief time joined us in our journey and helped us write the last chapter. St Luke’s is committed to achieving that for as many people as possible, for our whole community. A community where every dying person can feel connected and no person has to die alone. A community where everyone can achieve a peaceful and comfortable death that is free from pain and distress. “You matter because you are you, and you matter to the end of your life. We will do all we can to help you die peacefully, but also to live until you die” (Cicely Saunders). https://www.stlukes-hospice.org.uk/wp-content/uploads/2018/01/Jeff4-web..jpg 773 944 Robert Maltby https://www.stlukes-hospice.org.uk/wp-content/uploads/2018/04/stlukes-logo.png Robert Maltby2018-01-10 11:04:392018-01-10 11:11:32BLOG: The end of the story? 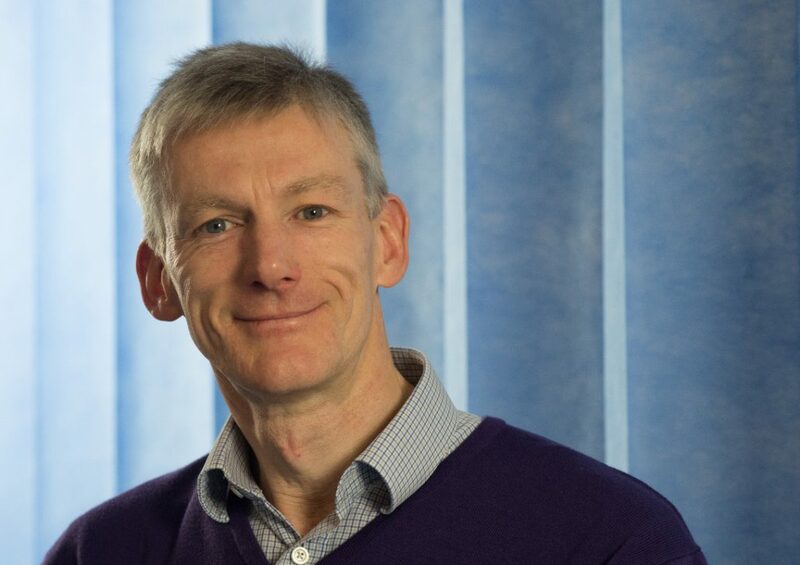 In the third of a series of articles on our care, Dr Jeffrey Stephenson, consultant in palliative medicine and medical director, talks about the role of medicine and the importance of honest conversations. At a recent conference one of the speakers spoke about the death of his three year old son. He wrote this for his other older son: Even in the darkest depths, when the world seems so unkind, there will always be a glimmer of light in the corner of your mind (H Hodgson). Simple and touching, it speaks of a truth that I have seen in almost everyone I have come alongside in my role as a hospice doctor. Those diagnosed with a terminal illness find themselves on a journey into the unknown, sometimes through chaos and deep darkness of emotional turmoil, but for most there is a glimmer of light that I would equate with hope. Initially that hope may be placed in medicine and the treatments on offer, the perhaps secretly held hope of cure when in reality that hope was never realistic. Often the imagery is of fighting the illness, and when someone dies we are told that they lost their battle with it. But the reality is that it’s not do we fight, or do we give up? It’s what are we fighting for? (Atul Gawande). For most of us there are priorities beyond living as long as possible, and if those priorities are lost along the way of treatment we are doing people a disservice. Medicine is stilł doing too much. We are over treating people instead of having honest conversations much earlier about quality of life and priorities in the limited time that is left. For those who have exhausted treatment options hope has a different hue. It may be of being pain free, or living long enough to achieve a landmark date, or of dying in peace and not alone. For some who are able to voice it there is the more poignant hope of something better beyond death. Part of my role is helping patients to manage hope, to transfer hope from things that are no longer realistic to ones that are and that sustain them through, and perhaps even enrich, the last chapter of their lives. Most often that enrichment comes through connection. That connection may be with loved ones, friends or carers, and it is about feeling held, esteemed, nurtured, and paradoxically safe in the face of what is to come. I’ve seen it again and again, the transformation that happens through simply coming in to the hospice and being loved and cared for, without necessarily any significant change in treatments. We cannot change the ultimate outcome of death, but we can journey with them through the ‘valley of the shadow of death’ (Psalm 23). And something beautiful happens, because we become part of their story and they become part of ours. None of us lives to himself, and no one dies to himself, or as John Donne put it, ‘no man is an island’. We talk a lot about patient-centred care, and quite rightly so. I recently saw a poster for a hospice care initiative entitled ‘All about me’, and it struck me that for most of the people I have cared for it absolutely isn’t! They are often more concerned about others, about their loved ones, about restoring relationships, about leaving behind a legacy that is framed in the context of its impact on those around them or still to come. I am frequently moved by the care and concern patients show for fellow patients in the hospice, and by the mutual support they derive from each other. I alluded earlier to the Biblical image of the valley of the shadow of death, which is one I find helpful as it provides a metaphor of my own journey alongside those who are dying. In order for death to cast a shadow, there must be a source of light. For those with faith, and certainly for the Biblical author of that image, that light may be God. For others it will be something else, but as they journey towards the last days of life most people indeed have a glimmer of light in the corner of their mind. Sometimes the hospice is that light. As their story plays out it is that light, that hope, that can bring meaning and richness to their experience, and to those around them, and ideally guide them to a ‘good death’, which is what we are ultimately trying to achieve for them. But what is a good death? I’ll look at that next time. St Luke’s and other hospices face major challenges going forward as we work out how to respond to the anticipated demographic changes in our society and the economic uncertainties. The hospice movement is 50 years old and its story has in many respects changed the narrative of the dying and bereaved in our society for the better. But movements peter out and influence wanes, and it is the next chapter that will determine whether in another fifty years time the story is alive and as positive as it is now, or just a footnote in history. Perhaps the greatest challenge that healthcare faces is the ageing population. More people are living for longer, which is good news but this brings with it potential problems. More than one in five people in north, east and west Devon are over the age of 65, and by 2021 this will have risen to almost one in four. Nationally, by 2035 half of all people dying will be aged over 85. As we get older the likelihood of living and dying with more than one medical condition rises dramatically, with consequences on health and social care provision. For instance, the number of people with dementia is projected to double by 2051. And all this at a time when money is getting tighter. The NHS is already creaking at the seams, and hospices are feeling the squeeze as it becomes harder to raise money. It isn’t just a case of how we are going to pay for the necessary care, but also who is going to provide it and where? One way for hospices to respond to the coming storm would be to focus on our buildings and beds, as it is often easier to raise funds for those, and provide a first class service to the handful of patients who end up dying with us. But that would be putting our heads in the sand, and it would diminish our impact on the bigger story. Only 5% of deaths happen in a hospice, and this proportion will reduce as the number of deaths rises. But times of great challenge are times of great opportunity. What if those with a terminal illness could be supported and receive excellent care wherever they are? What if you didn’t have to be in a hospice bed in order to be confident of having a good death? 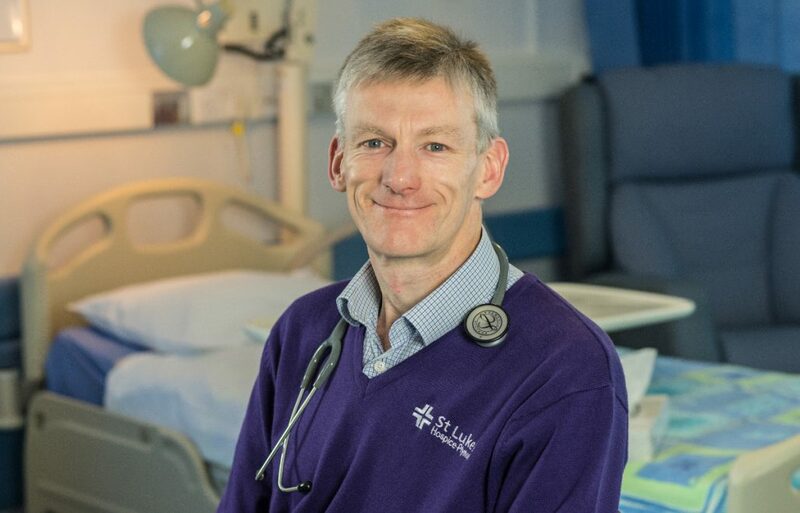 At St Luke’s this has become our vision – a community where no person has to die alone, in pain or in distress. 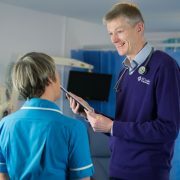 To achieve it we have embraced the concept of ‘hospice without walls’, taking the principles and values of hospice care into every care setting. 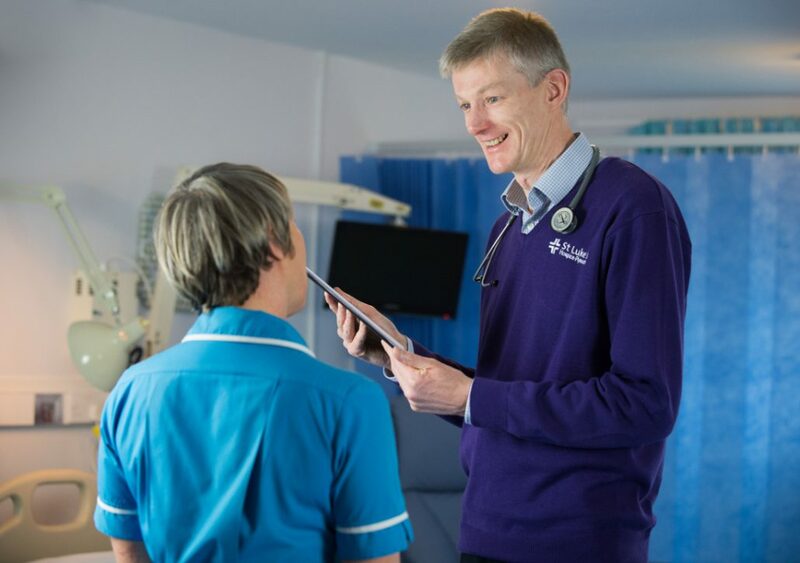 A few years ago we reduced the number of our beds from twenty to twelve, to be prioritised for those patients who really need to be in a hospice bed, enabling us to invest in improving care in other settings. We launched a crisis team and have embarked on projects to reach out to the homeless community and those in prison. We realise that we can’t reach everyone directly, so have invested in education and training for nursing homes and other professionals, and we are collaborating directly with other providers in the region. We are also embracing new technology to innovate and find new ways of providing care. We also recognise that to achieve anywhere near our vision is going to require the whole community to engage with death and dying, and bring it out of the shadows and the remit of professionals alone. 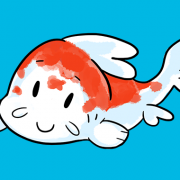 We all have a terminal condition – it is called life! There are already many community groups and individuals supporting those with terminal illness, and we need to support, encourage and multiply them. Our hospices are national treasures, but if they are not to become white elephants we need to adapt to the changing environment. And perhaps public perception needs to change a little as well. When we give to, and fundraise for hospices, we need to understand that they represent far more than beds, available to check into should we or our loved ones ever need to – and that that’s okay, because there is so much more at stake here. It is about changing the story for the better for thousands of people every year for whom the reality of a terminal illness crashes in, changing the script of their anticipated future. BLOG: What is hospice care? 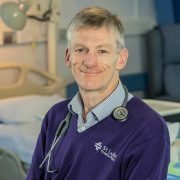 In the first of a series of articles on our care, Dr Jeffrey Stephenson, consultant in palliative medicine and medical director, explains how the hospice movement began. Most of us like a good story. Storytelling is a powerful way of communicating, and for all of us there are narratives that underpin the ways we behave and think and view the world. The story of the Hospice Movement is certainly a good one: a heroine (Cicely Saunders) challenges the medical establishment and speaks out about the poor care received by the dying; she gathers like-minded people around her and eventually founds the first modern hospice (St Christopher’s); she sets the standard for a different way of caring, with a focus on the person rather than the illness, and upon the quality of both dying and living until dying; it triggers a proliferation of hospices, creating a movement for change; eventually these standards of care filter back into mainstream healthcare, for the benefit of us all wherever we die. This narrative, and the values underpinning it, captivated my imagination as an idealistic medical student, and later as a junior doctor. During an attachment in a hospice I saw a different way of caring, and was hugely impressed by some inspiring role models. And it has captivated the public imagination. So many people have a connection with a hospice, through a friend or loved one, or through work or volunteering. Hospices have found their way into our hearts, and for many of us our own stories have become interwoven with the hospice narrative. That narrative is getting on now. 2017 marks the 50th anniversary of the movement, and it is also the 35th anniversary of St Luke’s Hospice Plymouth. But how well do we know the story? Or have we misunderstood the plot? After almost twenty years as a character, I am still surprised by the level of misunderstanding about what hospices are and do. I see it regularly in the eyes of patients in our outpatient pain clinic, for many of whom simply coming through the doors of the hospice has required a screwing up of their courage. My suggestion of an admission, to get on top of their pain quickly and safely, can be like a body blow – the unspoken assumption that going in to the hospice means I am close to the end and won’t get out. People do die in our specialist unit, but people also leave again. Around 40% of patients are discharged, and the focus of care is as much about optimising people’s living as it is managing their dying. But there are many misconceptions about hospices, some of which were recently highlighted by a national survey (Hospice UK 2017): a third of people believe that hospice care is only available in a hospice building; less than half are aware that hospice care is available in community settings; only three in five people know that hospice care is free, though most hospices are charities and the bulk of the cost of this care has to be covered through fundraising (typically about 30% is funded from the NHS). 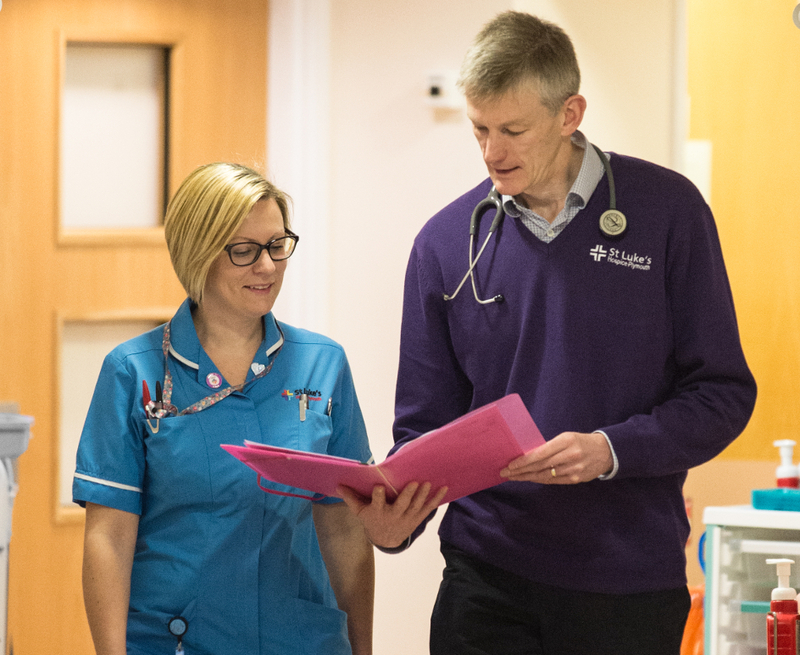 St Luke’s is so much more than just the hospice, and indeed the vast majority of patients whose care we are involved with never come into the actual hospice building. Last year 250 people were admitted to our specialist unit, but we saw 1500 patients in the community and 1100 in Derriford. A worrying misconception is that we routinely use morphine and other drugs to hasten death. It is an idea that is prevalent not just among the public, but also among other healthcare professionals, who ought to know better. And it prevails despite attempts to educate and reassure to the contrary. This is certainly not what we are about, and we go to great lengths to achieve good control of pain and other symptoms while minimising side effects of treatment. We have come a long way as a movement, and these misconceptions haven’t blunted our impact. But for me a story is only as good as its ending. A film or book can be ruined if the ending is a disappointment. And it is a fact that no matter how good our care and support has been through someone’s illness, if we get it wrong in the last days and hours and a person dies badly, that is what friends and family carry forward into bereavement. The story of hospice to date has been one of inspiration and success. But the true measure of the impact depends on how the story unfolds from here, and how we meet the challenges ahead. https://www.stlukes-hospice.org.uk/wp-content/uploads/2018/01/Dr-Jeff.jpg 773 1206 Robert Maltby https://www.stlukes-hospice.org.uk/wp-content/uploads/2018/04/stlukes-logo.png Robert Maltby2018-01-08 10:29:172018-01-10 10:57:53BLOG: What is hospice care?